Cedardale Arboricultural Specialists Ltd - Garden Services, Tree Surgeon based in Hartley Wintley, Hampshire. Invoice history based on 926 reviews. 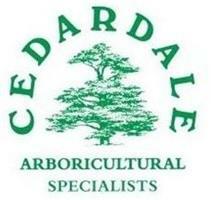 Cedardale are approved tree surgery contractors with Trading Standards (under their 'Buy with Confidence scheme) and a member of the Arboricultural Association and International Society of Arboriculture offering services to commercial and domestic clients. Cedardale are based near Hook in Hampshire. Cedardale offer services including pruning, dead wooding, reshaping and felling of trees and anything in between, hedge maintenance, tree stump removal, local log supplies and wood chip for bio fuel or composted for garden use. The firm offers comprehensive tree related services to businesses, which are designed to be cost effective at all times. With excellent health and safety support in house, the business also has trained staff allowing clients to be confident the works will be undertaken safely and efficiently. With a team of 6-8 experienced trades people, Cedardale has a professional team, qualified to the appropriate levels for the works undertaken. Cedardale has a satisfied network of clients, located in the local area, including councils, developers, housing associations, hotels, golf courses and many private sector clients. The company is managed by Chris Kunesch who has been involved in the Arboricultural trade for over 30 years. Having previously worked at the world famous Royal Botanic Gardens at Kew, Chris is still extremely focused on providing a top quality service to Cedardale's large customer base to manage the company future growth.